May 6, 2018 (Joseph Thomas - NEO) - The US and European-funded human rights racket comprised of organisations such as Human Rights Watch, Amnesty International and myriad fronts funded by the United States government via the National Endowment for Democracy (NED) have helped promote some of the worst human rights abuses in recent human history. This includes their role in selling the US-led NATO assault on Libya in 2011 and their continued role in justifying US-led military intervention in Syria. "Human rights" have been cited by the US and its European partners during NATO's assault on Serbia, among the first of the so-called "humanitarian wars." Of course, by citing "human rights," the US is able to paper over the very inhumanity the opposition groups it supports are carrying out, or the injustice of the destabilisation and destruction the US is attempting to perpetrate. And while Washington's systematic destruction of the Middle East has taken centre stage among international headlines, the US is also using similar tactics to pressure nations elsewhere around the globe, including Southeast Asia's Thailand. To the West, An "Activist"
When Somyot Prueksakasemsuk was released from prison after some 7 years behind bars, the US and European media and their partners in Thailand's media hailed the release of what they portrayed as an "activist" and "political prisoner." In reality, Reuters intentionally omitted any details about the publication Somyot was the editor of, "Voice of Taksin." The truth Reuters intentionally chose not to report is that "Voice of Taksin" was published on behalf of billionaire and ex-Thai prime minister, Thaksin Shinawatra. 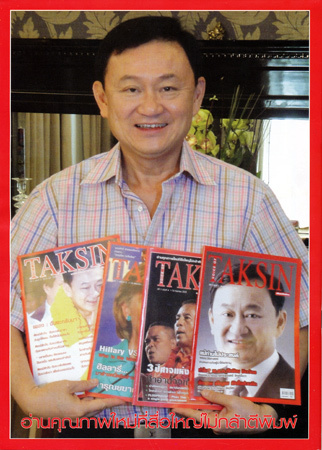 The publication itself regularly featured not only signed letters handwritten by Thaksin Shinawatra himself, but was also packed with threats of violence, calls for terrorism and armed insurrection, direct and indirect threats against Thailand's head of state (the nation's constitutional monarchy) and specific threats aimed at intimidating Thaksin Shinawatra's opponents. Shinawatra, ousted from power in 2006 after serial abuses of power including the systematic surrendering of Thailand's sovereignty to Western interests, has been supported ever since by an army of US-based lobbyists, US and European government-funded fronts posing as nongovernmental organisations (NGOs) and political opposition groups receiving political, financial and material support from the West in a bid to overthrow Thailand's political order and transform the pivotal Southeast Asian nation into a US client state. Somyot's publication distributed on behalf of Shinawatra, included vitriol that would not be tolerated in even the most liberal North American and European societies. Despite this fact, US and European media organisations have intentionally and systematically covered up the true nature of the publication for years and have defended Somyot disingenuously as an "activist." In a February 15, 2010 issue, Somyot's publication would feature the names, pictures, addresses and phone numbers of all judges scheduled to decide on an upcoming court ruling over the seizure of Shinawatra's assets, a court case lingering since his ouster from power in 2006. The article followed other pieces on punishing judges, the Nuremberg trials and assassinations with the implicit implication that these judges too should be punished and/or assassinated. 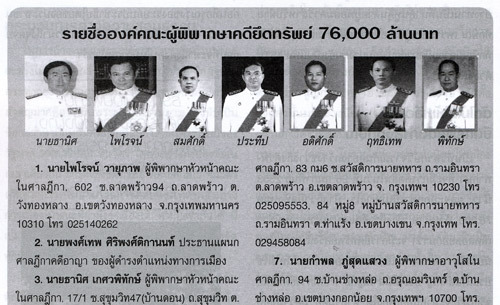 Image: The pictures, names, telephone numbers and addresses of judges were published in Somyot's "Voice of Taksin" magazine in between articles about judges throughout history being punished and assassinated. Despite the threats, on February 26, 2010 the court moved forward with the seizure of 46 billion Thai baht, the Guardian would report. In a bid to overthrow both the Thai government at the time, and the ruling political order including both the military and the monarchy, Thaksin Shinawatra moved forward with plans for armed insurrection backed by his US and European sponsors and their respective media organisations. 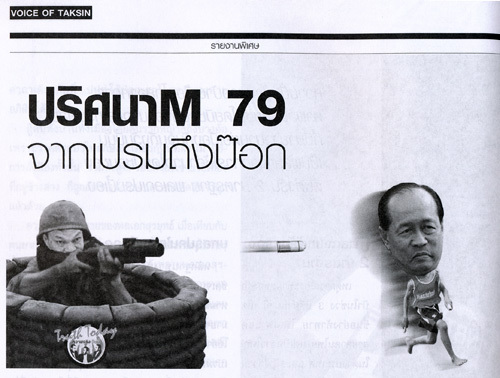 Image: Somyot's publication would depict cartoon-like images of Shinawatra's militant leaders shooting war weapons at key figures in the Thai government and military. On the streets of Bangkok, Shinawatra would then employ militants wielding M79 grenade launchers, assault rifles and bombs leading to bloodshed claiming nearly 100 lives. Somyot's publication would help prepare the rhetorical grounds for this upcoming bloodshed, with imagery of Shinawatra's militant leaders shooting grenades at prominent leaders in the Thai government opposed to Shinawatra featured with the open implication of targeted assassinations. 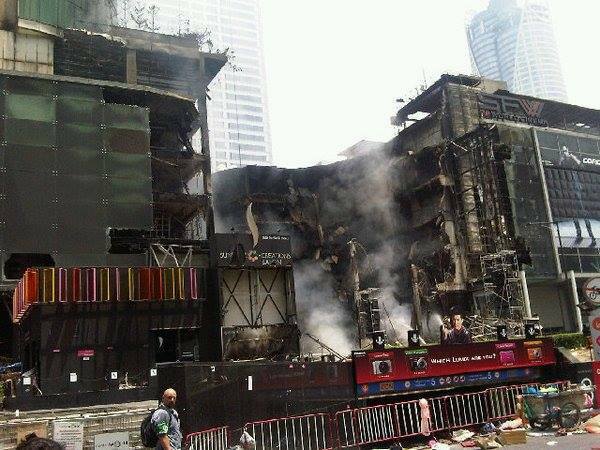 In a March issue, Somyot's publication advocated nationwide arson, which would in fact be carried out one month later, destroying sections of Bangkok and provincial halls upcountry and leading to several deaths of Shinawatra's own supporters trapped while looting torched shopping centres. Image: A call for arson in 2010. In an April 18, 2010 issue, after Shinawatra had fielded some 300 armed militants among several thousand supporters he bussed into the Thai capital of Bangkok to oppose the above mentioned court seizure of his assets, Somyot's "Voice of Taksin" publication announced and promoted the beginning of armed insurrection. Fortunately for Thailand, its security forces were able to successfully restore order to the city, but not after nearly 100 were killed in the ensuing gunfights and campaign of city-wide arson (for which Somyot's publication advocated) that followed Somyot's call to arms. For Shinawatra, his dreams of armed insurrection did not extend beyond the mercenaries he was able to hire and arm. Despite the open threats and admissions of carrying out violence published in Somyot's "Voice of Taksin" magazine, fully endorsed by Thaksin Shinawatra himself, the Western media has ever since depicted the 2010 violence as a brutal "military crackdown." However, a 2013 Reuters article would decry the sentence and cite "condemnation from international rights groups and the European Union." While the 2013 Reuters article would admit Somyot's publication was written on behalf of Shinawatra, it did not discuss the nature of the publication. 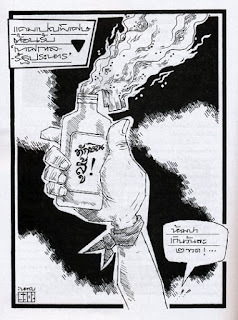 Image: Somyot's publication advocated arson and terrorism that translated directly into real deaths and city-wide destruction. Instead, it depicted criticism of Thailand's head of state as merely an expression of free speech, ignoring the bloody imagery and references to historical episodes of regicide included in virtually every issue of "Voice of Taksin." Reuters would cite Human Rights Watch, David Streckfuss, the European Union Delegation to Thailand and US-trained and funded "academic" Sawatree Suksri. It is unlikely these organisations or individuals did not possess copies of Somyot's publication, and even failing to read its contents in native Thai, not notice the disturbing and very straight forward violent imagery used throughout its pages. They were fully aware of the nature of Somyot's crimes, and intentionally ignored it, leveraging "human rights" rhetoric to defend and cover up his criminality. For Somyot's employer, Thaksin Shinawatra himself, he stands as one of the worst human rights violators in Thai history. In 2003, the US and Europe's own human rights racket was forced to take notice of his brutality when he launched a 90 day "war on drugs." According to Human Rights Watch, over this 90 day period police acting on Shinawatra's orders extrajudicially executed over 2,800 people in the streets without formal charges, arrests or trials. Amnesty International, another mainstay of the US and Europe's human rights racket, was also forced to take note of Shinawatra's abuses while in power. It would describe how just in his first term in office at least 18 human rights defenders were assassinated or disappeared. Another organisation keen on perpetuating the West's human rights racket, the Committee to Protect Journalists (CPJ) would detail Shinawatra's assault on the free press during his time in power. Interestingly enough, now that US and European interests seek Shinawatra's return to power, these previous reports have all but been buried. Each aforementioned organisation has shifted entirely to defending his political party and political opposition groups working on his behalf, including characters like Somyot. The track record of violence, terrorism and abuses of these groups have all but been expunged. And amid this campaign to whitewash Shinawatra's past abuses, is Somyot and his mischaracterisation by the Western media as an "activist," not merely the paid propagandist of a vicious politician attempting to claw back power. 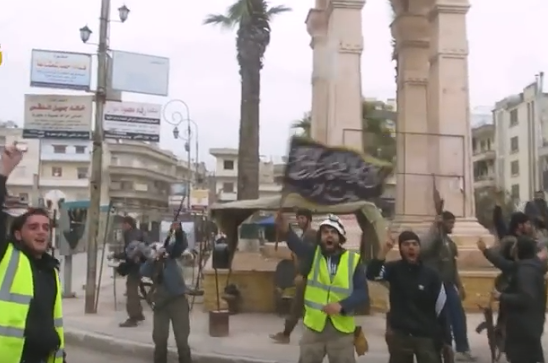 Like the US and UK government-funded "White Helmets" (Syria Civil Defence) in Syria or the leaders of the 2013-2014 Euromaidan protests in Ukraine, fronts depicted by the West as progressive humanitarians and pro-democracy advocates are revealed as precisely the opposite. 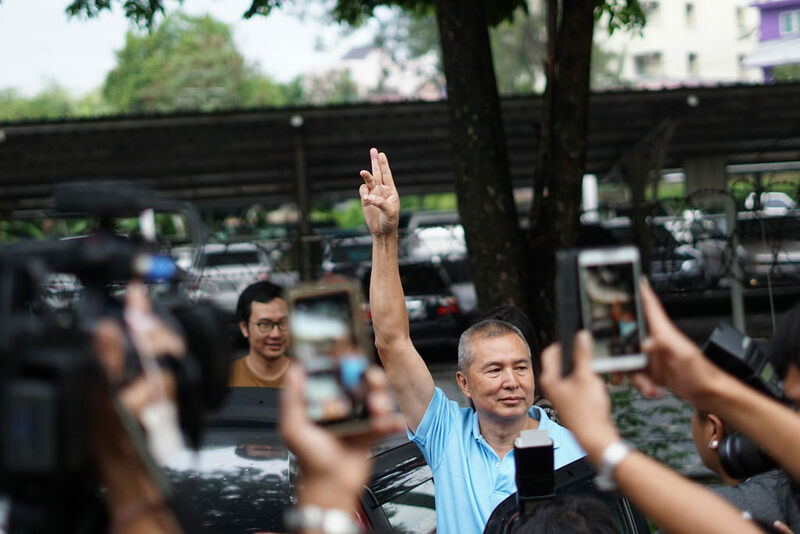 The US and European media celebrating Somyot's release represent special interests that would not tolerate Somyot's rhetoric and methods had they been directed at their power bases in Washington, on Wall Street or in the City of London and Brussels. For Washington, the overthrow of Thailand's political order fits into a broader regional strategy of encircling China with client states serving US interests. Thailand, particularly since the ouster of Shinawatra in 2006 and the ouster of his sister Yingluck Shinawatra in 2014, has further cemented ties with both its Southeast Asian neighbours and Beijing through growing military, political and economic ties. Thailand, once portrayed as a key ally of Washington, has become a prominent obstruction to Washington's "pivot to Asia." This may help explain why Washington and the media organisations in its service are eager to turn a character as unsavoury as Somyot Prueksakasemsuk into another "hero" amid their increasingly transparent human rights racket.